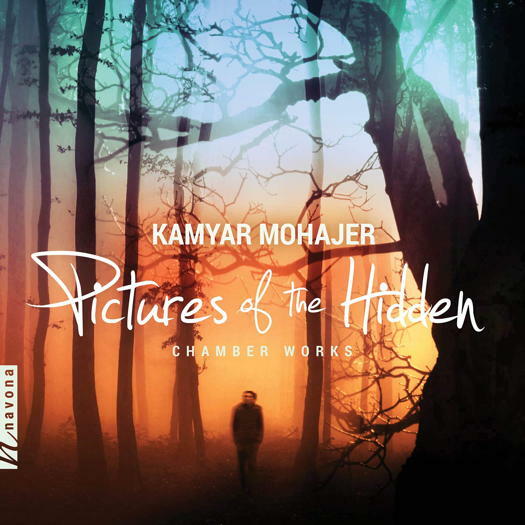 Thank you, Navona Records, for introducing me to a new young composer, Kamyar Mohajer. I had not heard of him or his music before, and cannot even find when he was born, but he is young, was born in Iran, grew up in Canada and now lives in the USA. He has quite a few works already published and recorded, and at least on this CD, he acknowledges the influences of J S Bach, the Persian poet Hafez, and his mother and father. These influences, and how these works are influenced by them, are mentioned in the programme notes. The first piece, Prelude (2013), performed here by the Ives Collective, is scored for violin, viola and cello. This music is reflective and quite sombre in tone. The mid range is mostly used to create a sort of autumnal meander. The piece is melodic in nature not at all a challenge to listen to. Whilst it does intensify to a climax, this is not an overwhelming one, and does not disturb the work's contemplative nature. The performance is sensitive and meditative. The short, lively wind quintet movement Reng (2017), performed by the San Francisco Wind Ensemble, is dance-like and incorporates a popular Persian dance rhythm. The composer imagined dancers, sometimes as a group, and sometimes the group revolves around a central one or two. I am sure that this will become a popular work for wind quintet. It is beautifully performed and written, and its engaging mood is well captured. Five Songs Based on poetry of Hafez (2014) for soprano (Raeeka Shehabi) and piano (Karolina Rojan) are dedicated to the composer's mother, who was a traditional Persian vocalist and educator. Some of the composer's earliest memories are of going to sleep in his cradle, hearing his mother sing. The first of the songs is entitled 'Pictures of the Hidden'. At times, the melodies remind me of some of the Spanish music I have heard. The music is peaceful but also exalted, and the piano writing is skilful and interjects between long vocal lines. Usually the singer performs unaccompanied in long miasmatic lines, then the piano illustrates and fills out. This technique is interesting. After about half way through the work, they begin to work together until the separate technique re-appears at the end of the work to conclude it. 'It's Sunrise' is a happy little piece in which the singer and pianist start with two note motives. This expands, although the two note motive is predominant throughout the song. 'Light-Burdened Ones on Shore' is a slow piece with a kind of barcarolle rhythm to symbolise the sea at night. It is reflective, fits the mood of the words well, and fades away to mothing. The two note motive from the second song is expanded in 'It's Sunrise, Concluded', and the overall mood of the song is more reflective. The pianist supports the singer a lot more than in the first two songs, and the music rises to an exultant climax before subsiding to a slow and measured conclusion. I particularly enjoyed this song. The final song, 'Pictures of the Hidden, Concluded', brings us back to the first song, as the title suggests. I cannot help but be reminded of the music of de Falla in both the first and last song. Again, the two performers are often left apart for extended passages before coming together at key points. I believe that this group of songs will become very popular, with much to offer performers and listeners alike. The performers here are superb. Mohajer's String Quartet (2012), performed here by the Alexander Quartet, a really first class ensemble, was written during the period after the composer's father died. The opening Andante reflects this, and expresses a poignant loss. I am struck by how well the composer writes for this ensemble. The movement unfolds gathering power as it progresses, before settling into the poignant opening mood. The second movement, Moderato, is contrapuntal in character and quite anguished at times, reminding the listener sometimes of Shostakovich. The pace and mood is maintained almost to the end of the movement, where it slows down before the final section returns to the opening mood. The third movement, Adagio, is a lament, and indeed the composer saw the last section of this movement as a bittersweet farewell. This is powerful music, but the sorrow is not overstated. The last movement, Allegro con Fuoco is just that - quite busy and fiery, somewhat driven, and again reminding me of Shostakovich. After a slow, reflective middle section, the tempo picks up and the opening intensity reasserts itself. This is superbly crafted music which commands attention and really impresses me. The final work, Ballade in C for solo piano (2013), again features the pianist Karolina Rojahn. Nearly ten minutes in duration, it starts calmly but goes though various moods. At times it is quietly reflective, and at others quite restless and powerful, and sometimes is mysterious and sinuous. It reminds me of Szymanowski at times, and sometimes hints of Chopin or even Rachmaninov, although it's certainly not derivative. This is quite a marvellous work, with some fiendishly difficult passages. I predict that we are going to hear a lot more of this extremely talented composer, who has a lot to say and expresses it very well. I hope other listeners will enjoy this music as much as I have.